Few would deny that agriculture is especially severely affected by climate change and that the right practices contribute to mitigate it, yet expectations of the new climate agreement diverge sharply, as well as notions on what are good and what are bad agricultural practices and whether soil carbon sequestration should be part of carbon trading. Many Annex I countries want (virtually) all funding to come from carbon offsets, emissions trading and projects in Non-Annex 1 Countries (largely the South). In 2008 a record 4.9 billion tonnes of carbon dioxide equivalent (CO2e) emission reductions were traded on global carbon markets, and carbon trading increased by 83% in just one year, but this trading has not led to a reduction in emissions. Since the Kyoto Protocol came into force in 2005, global CO2 emissions continued to increase until the advent of the current global economic crisis. Carbon trading thus does nothing to prevent emissions from fossil fuel burning in the North and there is strong evidence that Clean Development Mechanism (CDM) credits are being used to subsidise some of the most polluting industries in the South. Not surprisingly therefore, carbon trading has not delivered emissions reductions. Few have realized that there are already several agricultural methodologies under the CDM, and many projects exist, particularly in relation to pig farms and oil palm plantations. These are contested for many reasons such as biodiversity destruction and soil and water pollution. These methodologies approved by the United Nations Framework Convention on Climate Change (UNFCCC) actually help to subsidize and legitimise intensive industrial pig farms and plantations while allowing polluting industries in the North to avoid emission reductions. The situation is set to worsen quickly as new CDM methodologies for agrofuels, for charcoal from industrial tree plantations used as a fuel, and for the inoculation of soya and other legumes have recently been adopted by the CDM Board. Offsetting is based entirely on the hypothetical reduction of emissions that would supposedly have occurred had the project not been in place. Hitherto there have been certain limits to the scope of CDM projects. Parties to the Kyoto Protocol had ruled that soil carbon sequestration and avoided deforestation are not eligible for CDM credits and furthermore, afforestation and reforestation (a term, misleadingly applied to industrial tree plantations) can only account for 1% of Certified Emission Reductions. Now there is pressure to remove all these limits to offsetting. One reason given is that capacity to measure, report and verify emission reductions has improved. However, after having had to bail out the banks, there is little appetite in the industrialised countries to provide public funding for dealing with climate change. Instead they hope to raise private funds by offsetting and trading of Certified Emission Reductions. Meanwhile, the doubts regarding the sustainability of the methods themselves still remain. There are attempts in the Copenhagen negotiation drafts to render agricultural offsetting far easier than in the first phase of the Kyoto Protocol by making soil carbon sequestration eligible for carbon-trade finance and by including agriculture, including soil carbon, into new mechanisms, which most Northern governments want also to be funded through carbon trading. Negotiation texts suggest that certain parties are endeavouring to get agriculture into the language wherever possible, so that they can more easily increase the role of carbon finance in agriculture. Not surprisingly, businesses proposing hypothetical emission reductions are proliferating, such as the 25x’25 Coalition that predicts additional annual gross revenues for the US agriculture and forestry sector of over $100 billion from US domestic offsets alone, corresponding to 50% of the total value of US agricultural production. Although the potent gases nitrous oxide (N2O) and methane represent the largest direct emissions from agriculture, the emphasis of the agriculture debate in the context of a climate agreement is based on carbon sequestration in soils, a consequence of the dominance of the offset approach. The 2007 IPCC 4th Assessment report, which quotes a calculation of the technical mitigation potential of carbon in soils of up to 6,000 Mt CO2e/yr and suggests that the greatest mitigation potential is in developing countries, is being quoted widely as an alleged endorsement of proposals for agricultural offsets including soil carbon sequestration. However, the IPCC stressed that there is a difference between a 'technical' and an economic' potential and that there are also social considerations. It also cited evidence that 'financial incentives and regulations' can help with climate change mitigation in agriculture something very different from what is being proposed for any new climate agreement. Soils are complex systems with rich biodiversity, organic matter, water flows, complex layers and aggregates. Degradation comes fast, while the building of soils, particularly the organic matter content, takes decades or centuries. While few would deny a relationship between soil degradation and climate change, most of the methods for soil carbon sequestration discussed in the context of recent UNFCCC climate talks are likely to further increase soil degradation. Restoration of degraded soils invariably requires increasing soil organic matter, which the proposed methods do not provide. The inclusion of soil carbon sequestration in carbon trading has been proposed by the United Nations Convention to Combat Desertification (UNCCD) and several governments, with biochar explicitly mentioned. Even though the word has now disappeared from draft negotiation texts, that does not mean it is off the table. If soil carbon sequestration was included in the CDM, for example, the CDM Board could adopt methodologies for a wide range of practices, including biochar, without any further discussion by governments. No-till, which has repeatedly been proposed by biotech and agribusiness companies, is included ‘by default’. Proposals in UNFCCC workshops and side events have also included agricultural practices such as intensification of industrial livestock production, GM crops, a further move towards a bioeconomy, and the use of so-called marginal land. In no-till agriculture (non-tillage or NT, also called conservation agriculture), soil carbon emissions are supposed to be reduced by not tilling the soil. The term is often used in conjunction with ‘reduced tillage’. Weeds are usually killed off through the application of herbicides instead, and genetically modified (GM) crops tolerant to herbicides lend themselves to this practice. But experience from existing large scale no-till agriculture (especially with GM soya in Argentina and other GM crops in the US) reveals negative impacts on the environment and climate, while, according to IPCC and others, the carbon sequestration capacity of no-till soils is not conclusively proven. The impacts on soil respiration, de-nitrification, N2O emissions and thus overall greenhouse gas emissions, and how no-till compares to other management systems are also largely unknown. In view of the inconclusive mitigation data, a call for offsets from NT or “conservation agriculture” is not appropriate. Biochar is proposed as a new form of soil carbon sequestration in which fine-grained charcoal is applied to the soil. This carbon is identical to the black carbon which is known for its negative impacts on climate change when airborne. The International Biochar Initiative (IBI) argues that applying charcoal to soils would create a reliable and virtually permanent carbon sink, mitigate climate change, and make soils more fertile. In support, the IBI cites past applications of charcoal such as Amazonian Dark Earths in which charcoal was combined with varied organic residues over long periods. These, however, bear little resemblance to what is currently being proposed. Even studies by scientists who are members of the IBI indicate high levels of uncertainty. The burning of biomass to produce charcoal is described as close to carbon neutral because greenhouse gas (GHG) emissions during combustion are supposedly offset by CO2 absorption during new growth, but this ignores the impacts of conversion or degradation of the large areas of land needed to produce the quantities of biochar proposed by many advocates. Estimates range from half to one billion hectares, an amount that would cover between 1,5 and 3 times the land area of India. Furthermore, regardless of land-use impacts, burning or charring trees releases CO2 which new trees can decades to sequester again. It is also unclear what percentage of black carbon will remain in the soil, for how long, and how much will be turned into CO2 and emitted again. Recent research shows that adding charcoal to soil could even increase soil organic carbon losses, resulting in CO2 emissions. Significant black carbon losses during biochar application have been documented and soil erosion is another way for them to become airborne, when they could significantly increase global warming as well as potentially posing a risk to people’s health. Nevertheless, biochar has been proposed among others by the UNCCD, by a number of African countries and Belize, Costa Rica, Micronesia and, with a qualification, Australia. In support, UNCCD cites IPCC, which, however, has not come to any conclusion on biochar and did not comment on it in its most recent Assessment Report. Over 150 civil society organisations have rejected biochar as an offset method. Industrial livestock production is a major emitter of greenhouse gases, mainly nitrous oxide and methane. Grain feed production currently uses one third of global cropland and relies on chemical fertilizers that are responsible for most anthropogenic nitrous oxide emissions. Yet the response is to propose further intensification of industrial livestock production. Aquaculture is also turning increasingly to grain feed. Both threaten to increase land required for grain feed production, often at the expense of grasslands. However, grasslands represent a significant proportion of terrestrial carbon stores, mainly in their root mass, and they evolved in co-existence with livestock. Traditional extensive grazing is wrongly blamed for harming the climate. When grasslands are turned over to crops, often for more feed for ever more livestock, they release their carbon stores to the atmosphere. Animal products are not required for a healthy diet, contrary to widespread belief. The intensification of industrial livestock and aquaculture is not a sustainable option. However, reducing production of industrial livestock and fish could help to reduce emissions rapidly while other climate change mitigation policies, including in the energy, and transport sectors are implemented. This is because methane has a half life of only seven to eight years whereas some 25% of the CO2 emitted today will remain in the atmosphere for 100,000 years or longer, so cutting methane emissions drastically now would have a rapid impact on stabilising climate change. GM crops have not yet been formally proposed as such for offsetting, but they are being advocated as likely solutions to a wide range of problems linked to climate change. In particular GM is presented as a means to increase yields on existing agricultural land, even though no crops have actually been engineered for yield increase and current GM crops have not led to increased yields but only to some temporary reduction of losses. Hundreds of patent applications have been made for so-called “climate ready” GM crops. Other promised solutions include extending the geographic and climatic range of crops and their capacity to tolerate salt, drought, heat and floods, as well as engineering plants so that applications of nitrogen fertilizer can be reduced. In fact, such crops have been heralded since the 1980s, promising drought and salt tolerant crops and nitrogen-fixation as a means to combat hunger but no such GM crops have yet been launched. At the same time GM crops have led to problems such as serious herbicide resistance among weeds, requiring additional herbicide applications, with negative impacts on environment and climate. Other projects include trying to genetically modify micro-organisms and enzymes to reduce the energy required to break down biomass into agrofuels and other fossil oil substitutes, although the consequences of their potential escape and multiplication in the environment are incalculable. There are ambitious plans to develop a new bioeconomy based on biomass refineries to produce substitutes for fossil oil. The biotech industry clearly sees climate change as an unlimited opportunity for expansion and is lobbying for GM to be recognised as offering key solutions that must be protected by strong intellectual property rights. Another proposal is to increase the acreage for agriculture by using so-called “marginal”, “degraded” or “waste” lands. However, unused land is rare. What's seen as marginal land is often land used by marginalized people, by economically weaker sectors of communities, especially women. Much of it is communal land, collectively used by local people who might not have an individual land title, but for whom it is a vital resource for water, feed, food, medicines, fuel and other purposes. Such land is also essential for biodiversity, water supplies, soil and ecosystem regeneration. In some cases, governments have even classed diverse forests on which communities depend as ‘wastelands’. FAO was in favour of major increases in funding for agriculture in a Copenhagen agreement arguing that “millions of farmers around the globe could also become agents of change helping to reduce greenhouse gas emissions”. Their land may now become the target of businesses that intend to sequester carbon in soils. The importance of agricultural biodiversity: In addition to threats to their land, and policies that are hostile to their interests, small farmers also face increased erosion through climate change of the agricultural biodiversity that they have selected and developed over centuries. Yet it is increasingly obvious that their practices and knowledge can help to stabilise climate, conserve water and secure food supplies. The International Assessment of Agricultural Knowledge, Science and Technology for Development (IAASTD) of 2008, emphasises the multifunctional role of agriculture and the importance of empowering, not marginalising, farmers, especially women farmers, to manage resources and the need to recognise them “as producers and managers of ecosystems”. Resilient ecosystems are fundamental to addressing climate change, water scarcity and food insecurity. Yet farmers continue to be forced off their land and climate change adds to their problems. Once the link between communities and ecosystems is broken it may be impossible to restore. 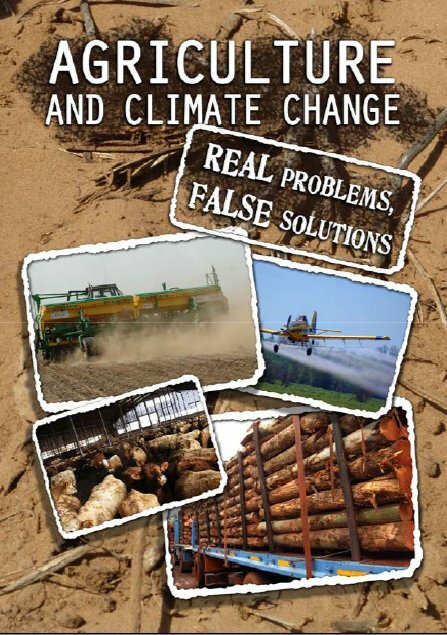 This report does not focus on the existing positive options for an agriculture that mitigates climate change. They have long been advocated by, for example, the world’s largest organisation of smallholder farmers, Via Campesina and received recent scientific backing by the IAASTD. These options have hardly been registered by the climate talks in the run up to Copenhagen. The challenge for a post-2012 climate agreement besides setting meaningful policies for reducing emissions, is to withstand the lobbying of companies seeking to extract carbon credits by including agriculture in a new climate agreement. Agriculture must be excluded from carbon market mechanisms. The writing of this report followed the negotiations leading up to the COP15 meeting of the Climate Change Convention and therefore got revised in this process. The first draft was published for the Climate Talks in Bonn in June 2009, followed by a second draft for a meeting in Bangkok in September 2009. This version also got translated into Spanish The final version with an additional chapter by the Norwegian Development Fund was published in December 2009 in Copenhagen. Report published for the Conference of the Parties, COP15, of the United Nations Framework Convention on Climate Change in Copenhagen, December 2009.